School of Medicine, Saint Louis University, Saint Louis, USA. Received June 7th, 2010; revised August 4th, 2010; accepted August 9th, 2010. Based on family conflict literature, there is a need for the development of a measure of family conflict resolution. contributor to psychological adjustment appears warranted. line levels after exposure to conflict resolution between parents. in this area of empirical investigation. tween family conflict resolution and psychological adjustment. and young adults and their families regarding conflict. P. T. ROSKOS ET AL. tapping the construct of family conflict resolution. the procedure and measures used will be provi ded. the time the study was conducted. aggression, and conflict among family members. Kleinman, et al. reliability was .85 (Moos & Moos, 1986). typically addressed in their family. Revised self-report measure of current psychiatric symptoms. t est-retest reliability for a two-week interval for the BSI is .90. (SD = .55) and for college females is .71 (SD = .42). cating the presence or absence of a psychiatric symptom. variance because of its strong concurrent validity data. 13-78, with higher scores representing higher life satisfaction. the FLSQ when comparing it to the LSS. and occupation, parent’s marital status, and psychiatric history. before each class within one week after distribution. correlated with a measure of life satisfaction (FLSQ R = −.29). 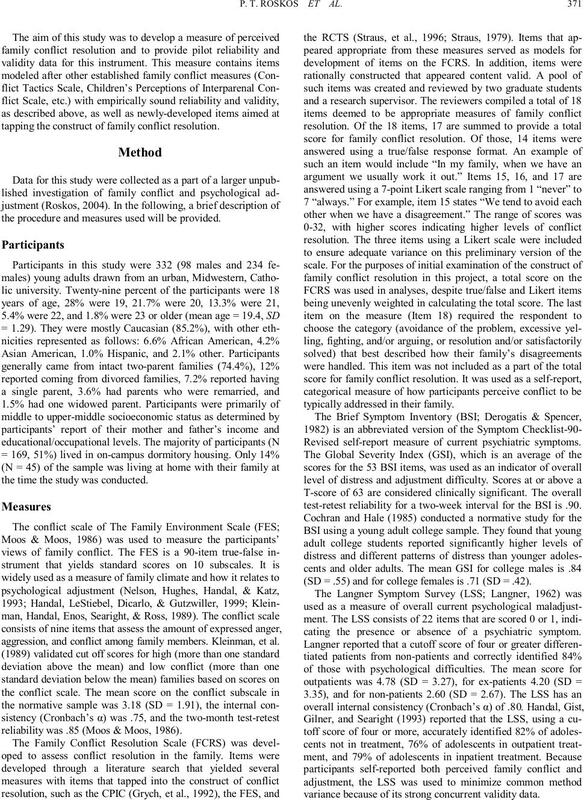 tionship between family conflict and psychological adjustment. and the three measures of adjustment as the dependent variables. Family Resolution; **p < .01, two-tailed. mine which conflict resolution groups differed on which DVs. below the mean) ranging from 0 to 5.
was used to determine items that loaded onto a given factor. and a summary of this principal component analysis. 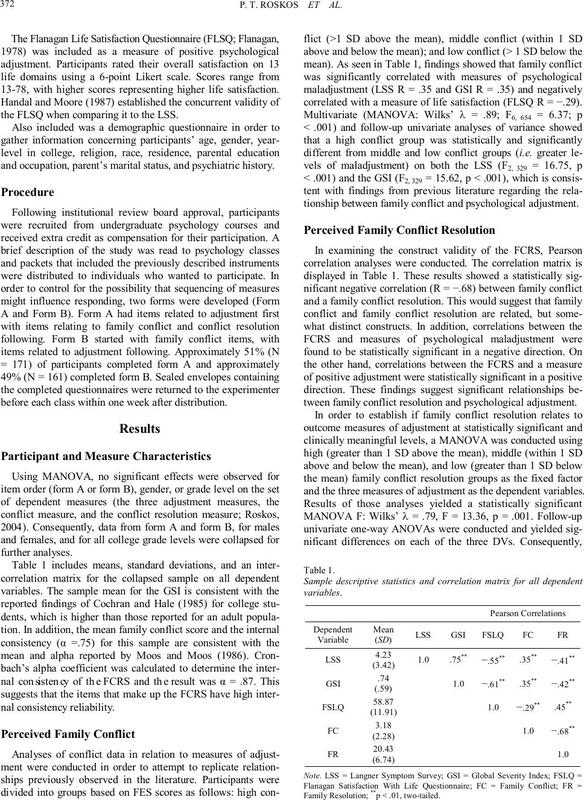 ANOVA results for family conflict resolution and adjustment measures. 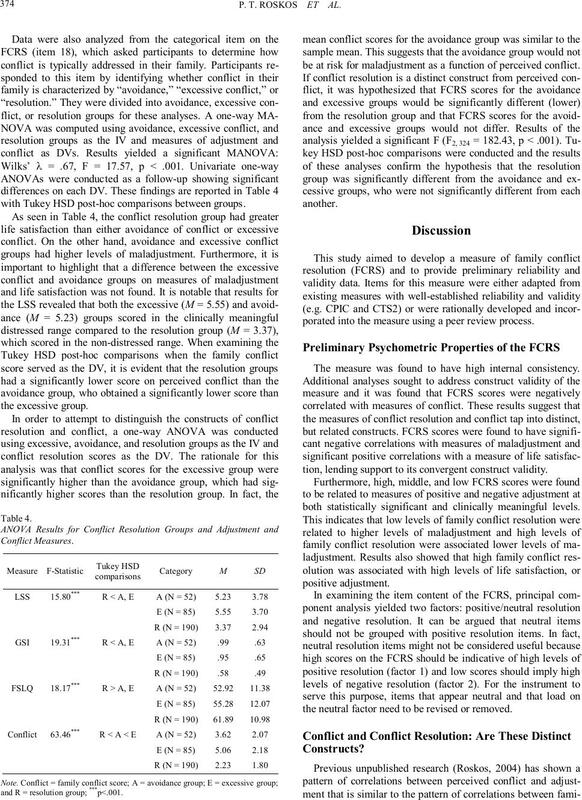 and H = high conflict resolution group; ***p < .001. 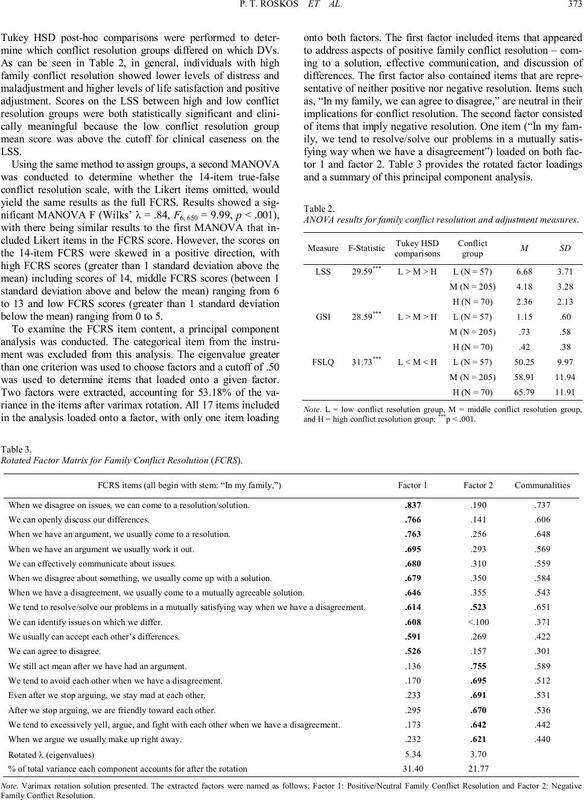 Rotated Factor Matrix for Family Conflict Resolution (FCRS). with Tukey HSD post-hoc comparisons between groups. and R = resolution group; ***p<.001. be at risk for maladjustment as a function of perceived conflict. porated into the measure using a peer review process. The measure was found to have high internal consistency. tion, lending support to its convergent construct validity. both statistically significant and clinically meaningful levels. the neutral factor need to be revised or removed. ship needs to be conducted. ty in a clinical setting. Borrine, L. M., Handal, P. J., Brown, N. Y., & Searight, H. R. (1991). Cummings, E. M., Ballard, M., El-Sheikh, M., & Lake, M. (1991). Cummings, E. M., Goeke-Morey, M. C., Papp, L. M., & Dukewich, T.
young children. Developmental Psychology, 21, 495-507. DuRocher-Schudlich, T. D., Papp, L. M., & Cummings, E. M. (2004). olution strategies. 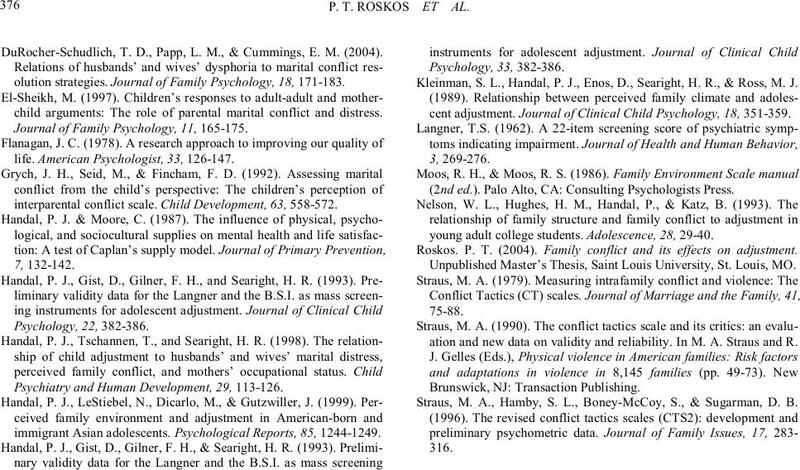 Journal of Family Psychology, 18, 171-183.
child arguments: The role of parental marital conflict and distress. 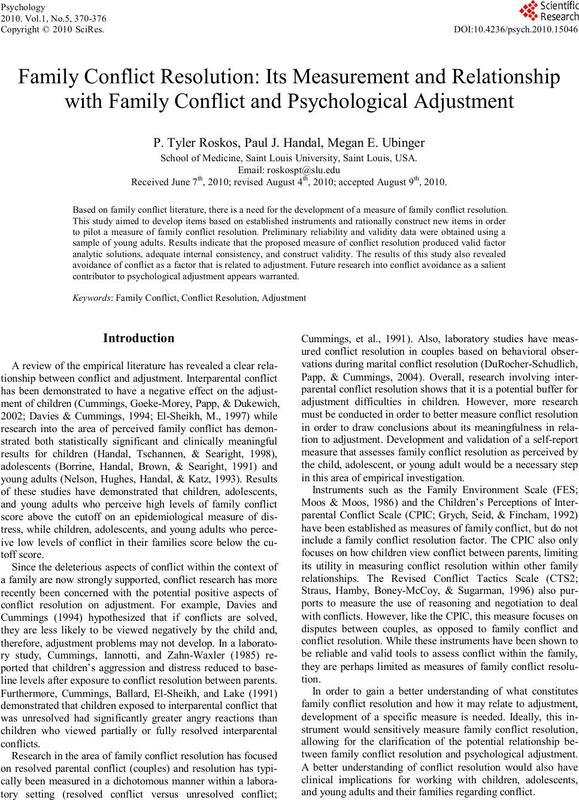 Journal of Family Psychology, 11, 165-175.
life. American Psychologist, 33, 126-147.
interparental conflict scale. Child Development, 63, 558-572. Psychiatry and Human Development, 29, 113-126.
immigrant Asian adolescents. Psychological Reports, 85, 1244-1249. Kleinman, S. L., Handal, P. J., Enos, D., Searight, H. R., & Ross, M. J.
cent adjustment. Journal of Clinical Child Psychology, 18, 351-359. (2nd ed.). Palo Alto, CA: Consulting Psychologists Press. young adult college students. Adolescence, 28, 29-40. Roskos. P. T. (2004). 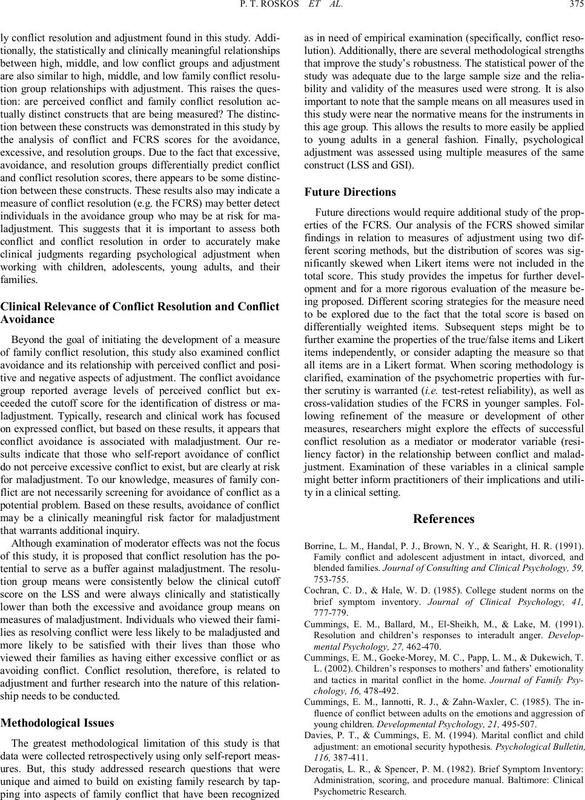 Family conflict and its effects on adjustment. Unpublished Master’s Thesis, Saint Louis University, St. Louis, MO. ation and new data on validity and reliability. In M. A. Straus and R.
Straus, M. A., Hamby, S. L., Boney-McCoy, S., & Sugarman, D. B.